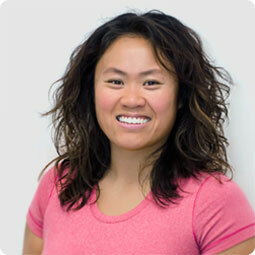 Joyce Wong graduated from the University of Alberta in 2005 with a Master of Science in Physical Therapy. Prior to this, she completed a Bachelor of Arts (Honours) in Anthropology with First Class Standing. Joyce joined the team at Kinsmen Sports Centre Physical Therapy Clinic in 2009. In 2010, she returned to school, earning the world renowned Master of Clinical Physiotherapy (Manipulative Therapy) from Curtin University in Perth, Australia, and with this gained the title of being a Fellow of the Canadian Academy of Manipulative Physiotherapy. In addition to this, Joyce has a certificate in Acupuncture through the Acupuncture Foundation of Canada Institute, a certificate in Orthopaedic Manual Therapy from Australia and a certificate in Gunn Intramuscular Stimulation. In 2016, she completed courses in the physical therapy treatment of concussion and became an R2P Certified Consultant. On top of treating patients, Joyce has also worked with the Physical Therapy department of the University of Alberta as a clinical instructor and teaching assistant. Joyce has a multifaceted approach to rehabilitating her patients. To complement her therapeutic exercise knowledge, she is a trained Yoga and Pilates mat instructor. She also has a special interest and extensive experience treating TMJ disorders. When she is not hard at work, Joyce plays with equal enthusiasm. As a former competitive swimmer, she has also been actively involved in the sports of track and field, rowing, and dragon boating. Currently, Joyce is competitive in Ultimate Frisbee, having won the 2016 Canadian Ultimate Championships with her team. When not throwing the Frisbee around, she enjoys running and has participated as a team in the Sinister 7 ultra marathon. Recreationally, Joyce enjoys cross-country skiing. Always in motion, Joyce also loves to occupy her time riding her motorbike. Phone 780-432-9555 to speak to one of our helpful front office staff to make your appointment. A medical referral is not necessary. Closed on Statutory Holidays and Weekends.